Try this beautiful citrus prawn salad - brilliant for sunny days with friends or the perfect pick-me-up whatever the weather. 1. Heat the oil in a frying pan and fry the pepper for 1–2 minutes. 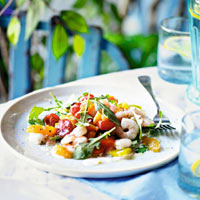 Transfer to a serving bowl and add the tomatoes, orange segments and prawns. 2. Whisk the lemon zest and juice with the mayonnaise and toss into the salad with the wild rocket.